Closed Holidays: New Year’s Day, Easter Sunday, Memorial Day, 4th of July, Labor Day, Thanksgiving Day, and Christmas Day. 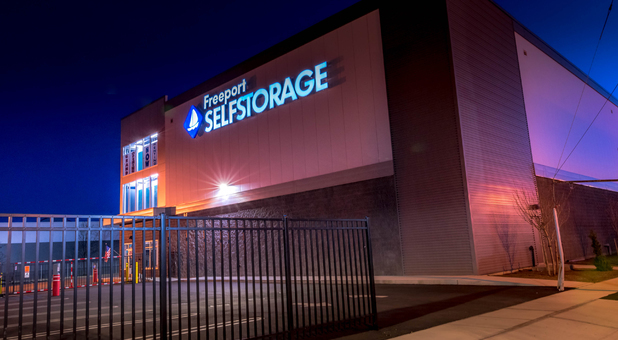 Freeport SELF STORAGE is your local one-stop source for all of your storage and moving needs. 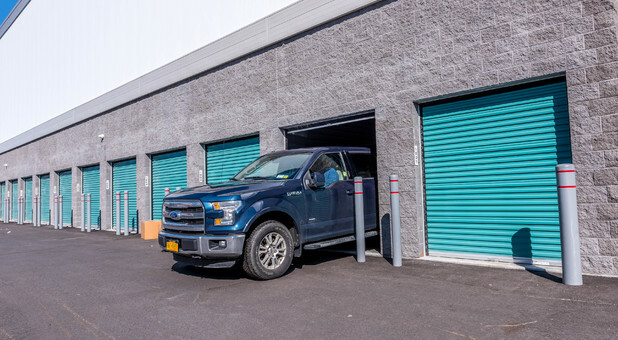 We offer a variety of unit sizes and rates to meet your needs. All rentals are month-to-month with a 12-month rental rate guarantee, no administrative or insurance fees. Ask a member of our staff to calculate how much storage you’ll need and how much it will cost. Need a mover? We’ll refer one. Need a truck? We’ll rent you one. Need boxes and packing supplies? We have all the standard moving supplies. Don’t see what you’re looking for? Call us today. More unit sizes and rates are available. For new customers only with mention of online offer. Locker. 4' High. Great for small items such as boxes, bins, and small furniture. Our most popular size. Holds 1-2 rooms of household items. Holds contents of 2-bedroom apartment. Similar to the size of a 1-car garage. Drive Up. 16' Ceiling Height. Similar to a 1-car garage. Similar to the size of a 2-car garage. Drive Up. 16' Ceiling Height. Similar to a two car garage. We use a pickproof cylinder lock. Three loading areas for your use. We have a moving truck available for rent. We sell boxes, tape, bubble wrap, shrink wrap, packing paper and & mattress & furniture covers. 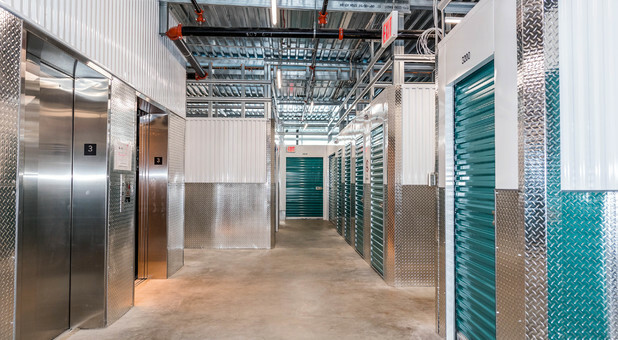 Easy access to the upper floors with the freight elevator. 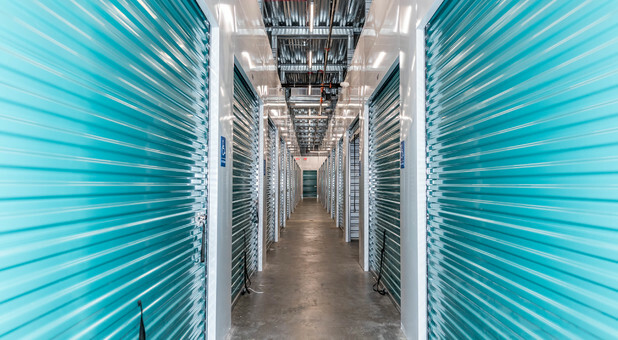 Our indoor units protect against foul weather and theft. Ground floor units are available. Upper level units are available. Providing extra protection with fenced and gated areas. We accept deliveries for our business customers. We provide electricity in select units. All units are wired and monitored. Fire detection & prevention system in place. We’ll accept, sign for and put away your deliveries. 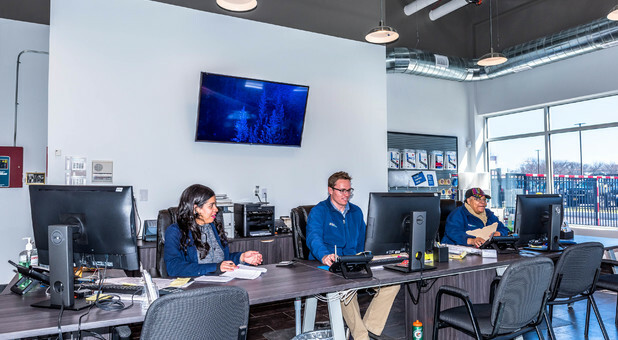 Our on-site management team is here to help you! Loading and unloading is easy with our complimentary carts. Take the Whitestone Bridge, to the Van Wyck Expressway, RT. 678 South, to South Conduit Avenue East (just before JFK Airport), this becomes Sunrise Highway, RT. 27 East. Take Sunrise Highway approximately 11 miles East into Freeport. At Henry Street you will see Dunkin Donuts on your left, go two blocks and turn right on S. Columbus Avenue. S. Columbus Avenue empties into our parking lot. If you miss S. Columbus, the next light is the entrance to Home Depot, go into Home Depot, turn right and drive across the parking lot. We are on the left and Staples is on the right. Exit the Home Depot/Staples lot and immediately turn left into our lot. Take the Long Island Expressway (LIE), RT. 495, West, to Exit 44, the Seaford/Oyster Bay Expressway, RT. 135, South. Take either Exit 2, West, which is Sunrise Highway, RT. 27 or Exit 1, West, which is Merrick Road, RT. 27A. Then take Sunrise Highway, RT. 27, West ¼ mile West of the Meadowbrook Parkway overpass there is a Home Depot on the left. Enter the Home Depot, turn right and drive across the parking lot. We are on the left and Staples is on the right. Exit the Home Depot/Staples lot and immediately turn left into our lot. Take Sunrise Highway, RT. 27, East into Freeport. At Henry Street you will see a Dunkin Donuts on your left, go two blocks and turn right on S. Columbus Avenue. S. Columbus Avenue empties into our parking lot. If you miss S. Columbus, the next light is the entrance to Home Depot, go into Home Depot, turn right and drive across the parking lot. We are on the left and Staples is on the right. Exit the Home Depot/Staples lot and immediately turn left into our lot. Take Merrick Road, RT. 27A, East into Freeport. Enter the Home Depot shopping center at the light. Our building is on your left as you drive in, go to the end of our building and turn left. Exit the Home Depot/Staples lot and immediately turn left into our lot. From the North Shore, take the Grand Central Parkway East, this turns into the Northern State Parkway. Take the Meadowbrook Parkway South, Exit 31, towards Jones Beach. Take Exit M8 West, RT. 27, and go ¼ mile West, there is a Home Depot on the left. Enter the Home Depot, turn right and drive across the parking lot. We are on the left and Staples is on the right. Exit the Home Depot/Staples lot and immediately turn left into our lot. Take Exit M9 West, RT. 27A, and go ¼ mile West and enter the Home Depot shopping center on the right. Enter the Home Depot, (our building is on your left as you drive in), go to the end of our building and turn left. Exit the Home Depot/Staples lot and immediately turn left into our lot. Take Sunrise Highway, RT. 27, West. ¼ mile West of the Meadowbrook Parkway overpass there is a Home Depot on the left. Enter the Home Depot, turn right and drive across the parking lot. We are on the left and Staples is on the right. Exit the Home Depot/Staples lot and immediately turn left into our lot. Take Merrick Road, RT. 27A, West. ¼ mile West of the Meadowbrook Parkway overpass, at the sixth traffic light, there is a Home Depot on the right. Enter the Home Depot, (our building is on your left as you drive in), go to the end of our building and turn left. Exit the Home Depot/Staples lot and immediately turn left into our lot. From the North Shore, take the Northern State Parkway, West. Take the Meadowbrook Parkway South, Exit 31, towards Jones Beach. From the South Shore, take the Southern State Parkway, West. Take the Meadowbrook Parkway South, Exit 22, towards Jones Beach. Take Exit M9 West, RT. 27A, and go ¼ mile West, there is a Home Depot on the right. Enter the Home Depot, (our building is on your left as you drive in), go to the end of our building and turn left. Exit the Home Depot/Staples lot and immediately turn left into our lot. 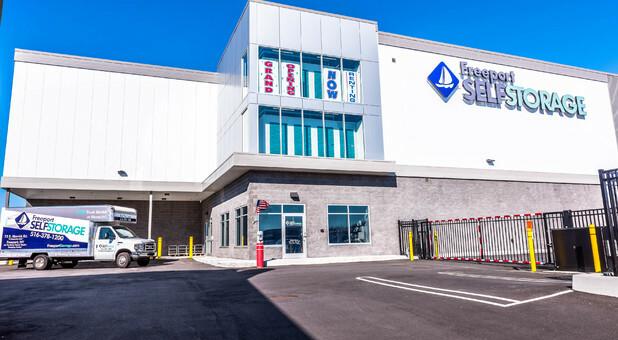 Freeport SELF STORAGE is a family owned and operated business that has been serving the community since 1997. 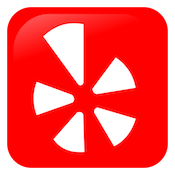 We pride ourselves on running a clean, safe & secure facility providing all of our customers with superior customer service. 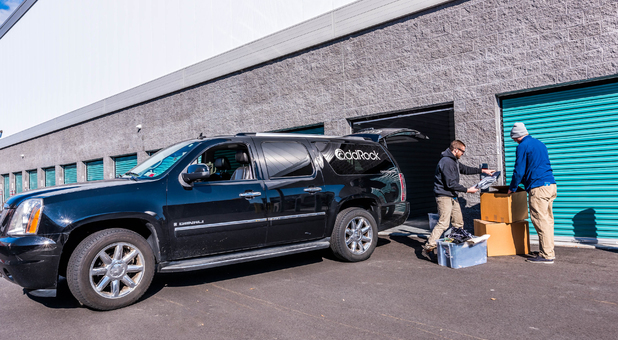 We understand that moving & storing your possesions can be a stressful event and our trained staff is committed to helping in every way possible. 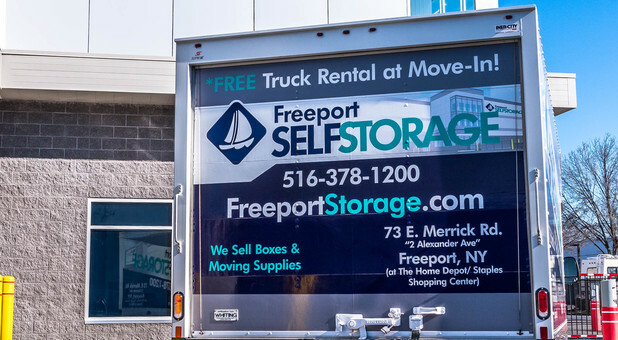 We offer more than just storage; we can rent you our moving truck or refer a mover, we sell packing & moving supplies, we will accept packages & deliveries for you, cardboard recycling is complimentary and our friendly staff awaits with a smile. 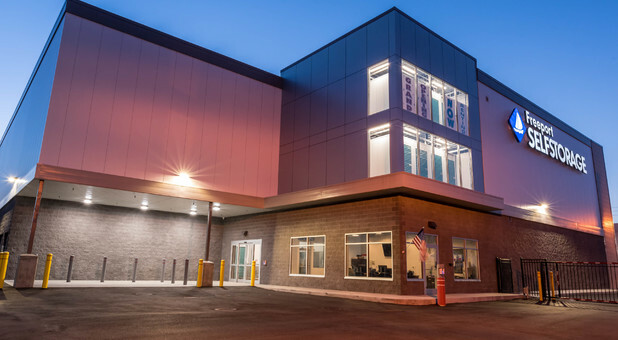 Come in to tour our facility, meet our staff and let us help you with all of your storage needs.